​Purple pins are for photos of signs or sites along US 285 that are accessible to both northbound and southbound drivers. 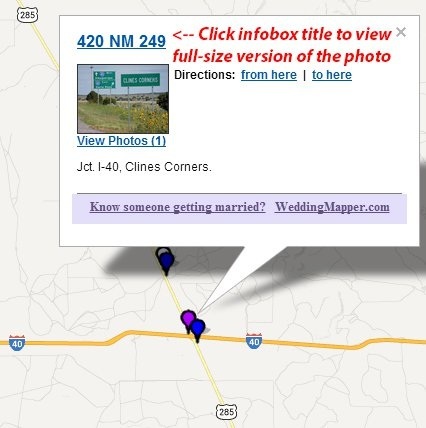 ​Deep blue pins are for photos taken northbound along current US 285. Light blue pins are for photos taken northbound along historic alignments of US 285. 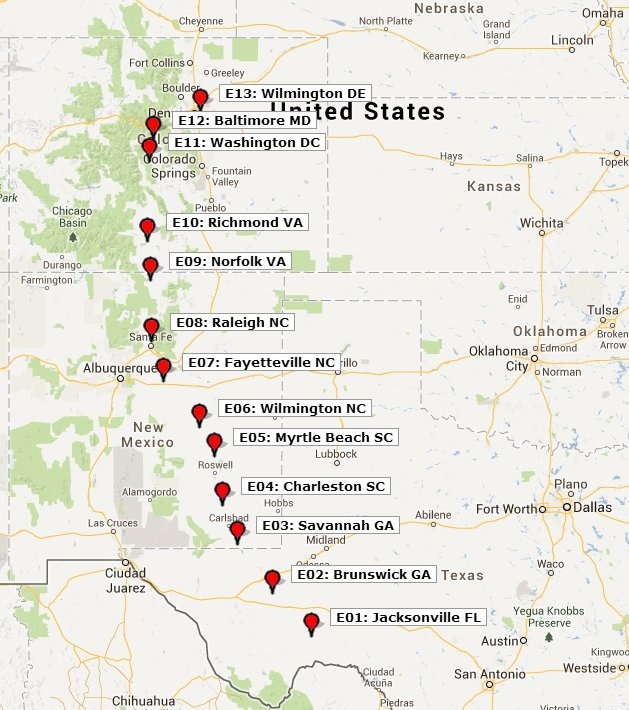 ​Bright red pins are for photos taken southbound along current US 285. Light red pins are for photos taken southbound along historic alignments of US 285. ​​The title of the infobox might seem like some cryptic alphanumeric code, but it is actually easy to decipher. The south beginning of US 285 is in Sanderson, Texas, and that junction was used as “mile zero” of the route. So if you click on a pin a few miles north of Sanderson, the infobox will say something like “017 TX”. That means the photo was taken 17 miles north of Sanderson. That number should correspond to the mile markers posted along US 285 in Texas. Now, when you cross into New Mexico or Colorado, the pins have an additional number. For example, the infobox example shown there has the title “420 NM 249”. The first number still refers to the mileage from Sanderson (so the example given would be 420 miles from the beginning of the route in Texas). The second number corresponds to the New Mexico mile markers (so the example would be 249 miles north of the TX-NM border). Likewise, pins in Colorado have both the mileage from Sanderson, as well as the mileage north from the NM-CO state line (hopefully making it easier to relate the pins to real-world mile markers). Now, some background for those who might be interested: some of my earliest roadtrip memories are from travels along US 285, and those drives certainly factored into what became a lifelong interest in geography and travel, as well as a career in cartography. I have always lived within a few miles of the north end of US 285, and the south end is at a town in Texas that shares my surname: Sanderson. I went to college in Texas, and later my kids did too. Combine all those coincidences, and perhaps you can understand my motivations to drive this highway from end-to-end... twice, actually. Altogether, US 285 is less than 1000 miles in length (846 to be precise). It runs through only three states: 264 miles in Colorado, 412 miles in New Mexico, and 170 miles in Texas. So it is not among the major border-to-border US routes (Canada is another 700 miles or so north of Denver). But those average-sounding figures can lead us to underestimate the magnitude of US 285. What would 846 miles look like somewhere on one of the coasts? For example, if a traveler were to start at the Tijuana border south of San Diego and head north on I-5, they would go all the way up the length of California and be well into Oregon before their odometer read 846 miles. Or, if a driver started in Boston and headed south on I-95, they would pass through ten states, and be well into South Carolina, by the time they had gone 846 miles. By the time of my junior year in college, I was getting a little bored with the “default” route between Denver and Waco. So in August 1988, I took the opportunity to drive US 285 all the way from Denver to its other end in Sanderson (photos from both termini can be found on the US 285 page). There are highway-enthusiasts who say they have “clinched” a road when they have driven it from end-to-end. I don’t have any qualms with that, but my own feeling is that I have not even begun to really know a road until I have driven it both directions at least once. I think that is particularly true with a road like US 285 that goes through mountainous terrain, because what is visible in the distance heading one direction is often completely different than what one would see heading the opposite direction. In 2013, 25 years after I “clinched” US 285, my eldest decided that he too would attend college in Texas. I determined that after dropping him off, I would take the long way home, by first making my way over to Sanderson, and then driving 285 from end-to-end again... but this time, from south to north. And this time, I did a lot of advance planning, and took lots of photos (hence the need for the map index). As a part of that planning process, I considered the fact that there are several places where the current alignment of US 285 has been changed from its original route. Some of these segments have been vacated, but others are still open to through traffic. 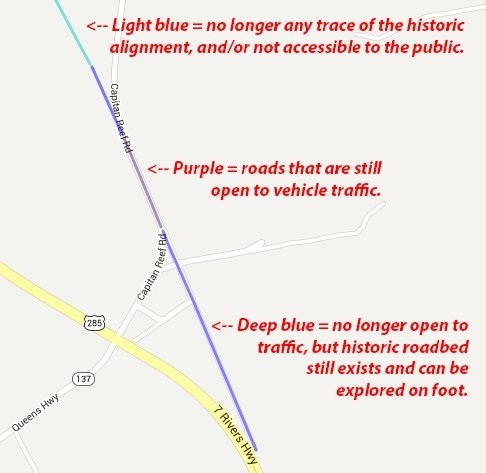 In cases where the older alignment is both driveable and relatively short, I took the time to drive both the current and the historic routings. Some examples include the old and new Rio Grande bridges in Espanola NM; the old and new Rio Chama bridges north of Espanola; and older alignments southwest of Denver. In other cases, the older alignments were too long for me to drive both. For example: US 285 traffic was originally directed to follow what is now Colorado state highway 17 west from Antonito, over Cumbres Pass and through Chama NM, then south on today’s US 84 through Tierra Amarilla and Abiquiu, re-connecting with today’s US 285 near Espanola. This is a distance of about 120 miles, and while the current route shortens that distance to about 77 miles, I had neither the time nor the inclination to drive both routings! So in cases like that, I had to choose just one of the alignments. To make that determination, I decided that (as much as possible) I would try to use what would have been the mainline routing during what I consider to have been the “golden age” of US routes (from the 1940s through about 1960). Since US 285 used the Cumbres Pass route only until the early 1940s, that meant I would follow US 285’s current route between Espanola and Antonito. (But in 2015 I went back and drove the original Cumbres Pass routing). There are also examples of older routings that no longer serve through traffic, or are no longer a part of the road network at all. I have explored most of these, including an orphaned segment of US 285 south of Morrison CO; the original routing through Santa Fe; as well as the roadbed that was used north of Carlsbad NM until the early 1980s (when construction of the Brantley Lake Dam necessitated a realignment). I also spent some time learning about the various ecological regions through which US 285 passes. So, enjoy! Currently there are about 700 photos in the album, and the best 400 or so are indexed on the map. Both endpoints of US 285 are shown and discussed on this page. last updated Oct. 8, 2016.